They say that March comes in like a lion, and goes out like a lamb. I’ll never forget the fist time I heard that expression: I was in my first semester of student student teaching, and my master teacher asked me to die cut some lions and lambs for our March bulletin board. I was totally baffled as to what those two animals had to do with the month of March; shouldn’t we just put up some shamrocks or something? You’d think I’d suggested crucifying the leprechauns themselves, with the look that first grade teacher gave me. In a tone that implied I had less sense than her six-year-old students, she lectured me on how a mastery of seasonal sayings was essential for any teacher who hoped to succeed in the first grade. I never did teach first grade after that student teaching rotation. But each March I think about those lions and lambs. The expression made little sense in California, when March starts and ends in about the same way (cool and dreary). But in Texas, the saying is splendidly fitting: March 1st was cold, the trees were bare, and my moods were dark. Weeks later, as March is on its way out, the weather has warmed up, the flowers are abundant, and life itself seems sunnier. 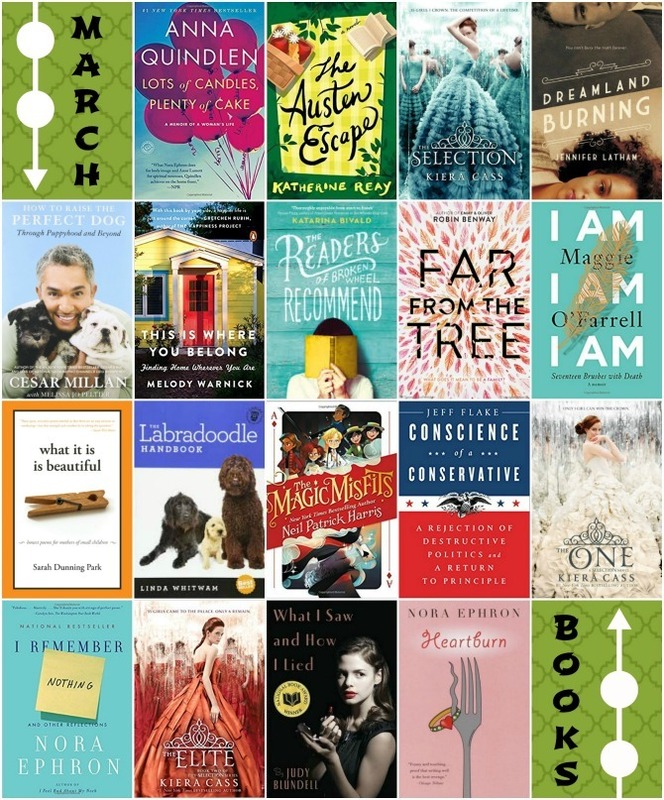 It was another big reading month for me. I added almost twenty books to my Read pile (not an actual pile, since only a couple of those books were read in physical form; the rest were audiobooks or ebooks). While there was some diversity in my book selections, there were also some noticeable themes: I read a disproportionate number of YA novels, including this guilty pleasure series, this powerful story about family and belonging (this middle grade novel shared similar themes), and two historical mysteries (this and this, both quite good). There were two novels centered around reading and books (this was fun, this was a major disappointment) and three memoirs about life and aging (strongly disliked this book, enjoyed this one, and LOVED this). I had a difficult time finding a book that interested me for this month’s Reading Challenge selection (a book of poetry, which is a genre far outside my comfort zone), but settled on this and was surprised by how much I enjoyed it. Well, it took us six months (watching at the pace of less than an episode per week), but Luke and I FINALLY finished a television series! 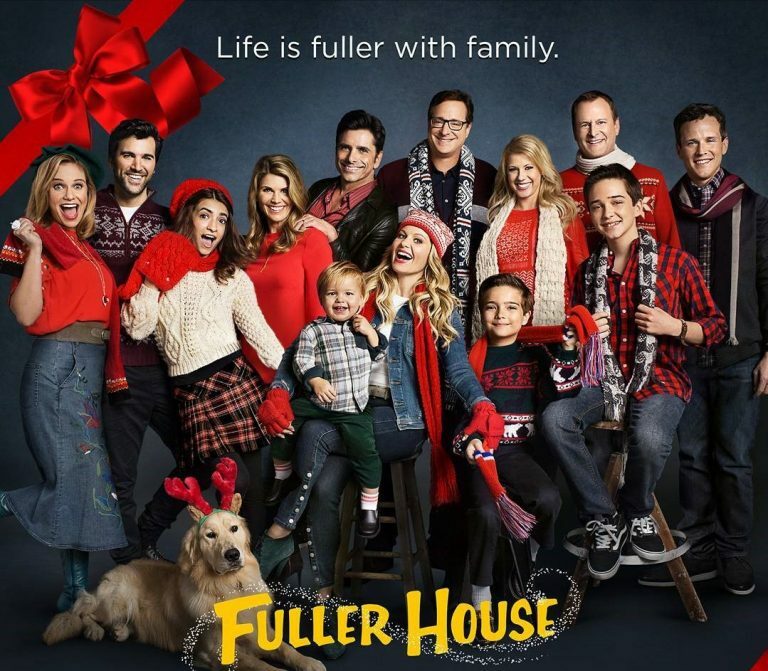 This third series of Fuller House was all that I hoped it would be: completely cheesy, but utterly heartwarming, and amazingly family friendly. I enjoyed the longer story arcs within the season (and finally getting some resolution regarding DJ’s love triangle), and I liked that the individual episodes offered up just enough comedy and drama to satisfy my cravings for a complete single-session television viewing experience (especially important given how little tv we watch these days!). This isn’t great television, but nobody expects it to be; I actually like that this show isn’t afraid to poke fun at itself, which just adds to the charm. I’m looking forward to another season (if we ever get around to watching it….). I loved the original Pete’s Dragon, and while this 2016 live-action remake is very different from its predecessor, it’s just as good. The story resembles the Pete’s Dragon tale we all know and love, and the filmmakers managed to preserve the heartwarming spirit of the original without simply remaking the same movie with new faces. The acting is superb, the scenery is spectacular, and the visuals are impressive. This version lacks the humor and music of the original; however, I found that I didn’t mind the darker tone and exploration of more difficult but realistic themes. We watched this movie as a Friday Night Family Movie selection; although Charleston had a lot of questions, and did cry in a few points (he felt REALLY sad for poor Elliot when he didn’t get to stay with his friend Pete), he mostly enjoyed it as much as Luke and I. There was a time when music was a big part of my life: listening to it, performing it, and even studying it (I have a Liberal Studies degree with an emphasis in music). These days I neither perform nor study music, and I dedicate most of my listening time to the spoken word (podcasts and audiobooks) or music of Charleston’s selection (mostly the Frozen soundtrack or WeeSing Bible songs). I mentioned this to some friends recently and they made it their mission to find some music that I would love so much I’d be willing to set aside the audiobooks to listen. I mentioned a few of my favorite groups (specifically The Wreckers and The Civil Wars, both now disbanded) and they suggested Joseph. It turned out to be an excellent recommendation! The trio of sisters from Joseph, Oregon, is technically a folk group, but their sound veers more rock than country. Their music features a strong beat and mesmerizing harmonies—my favorite combination! 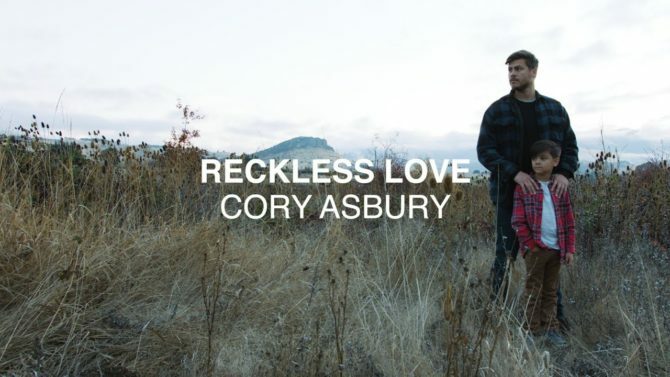 Cory Asbury was another excellent music discovery for me this month. The title song of his latest album is taking the Christian music scene by storm, so I’d likely heard it on the radio, but to be honest, most worship music sounds pretty much the same to me until I’ve either sung the song in church, or learned the song’s or artist’s backstory, which was the case with this album. After hearing Asbury share the amazing story of the album’s creation on Annie Downes’ podcast, I couldn’t wait to give it a listen. Wow! “Reckless Love” is the song that’s getting the most attention, and I love both the sound and the lyrics of that song, but my favorite tracks on the album are “Born Again” and “Endless Alleluia.” If you have any interest in worship music, you simply must give these songs a listen. + “Mom, I love your dress. It’s so pretty for you. You look like a beautiful princess!” And later, after I’d changed out of my dress (actually a tunic top), “Put your dress back on!” Then, the next day, “can I get a dress like yours?” Me: “I don’t think so, Bud. Dresses are usually just for girls.” Charleston: “But maybe we can get a dress for boys?” He then brought over one of his Bible story books to prove that Jesus (a boy) wore a dress. I mentioned in this post that I’ve been using the reading plans on my Bible app for my daily times with God. I’m currently working through a plan I love so much, I wanted to share it specifically here. 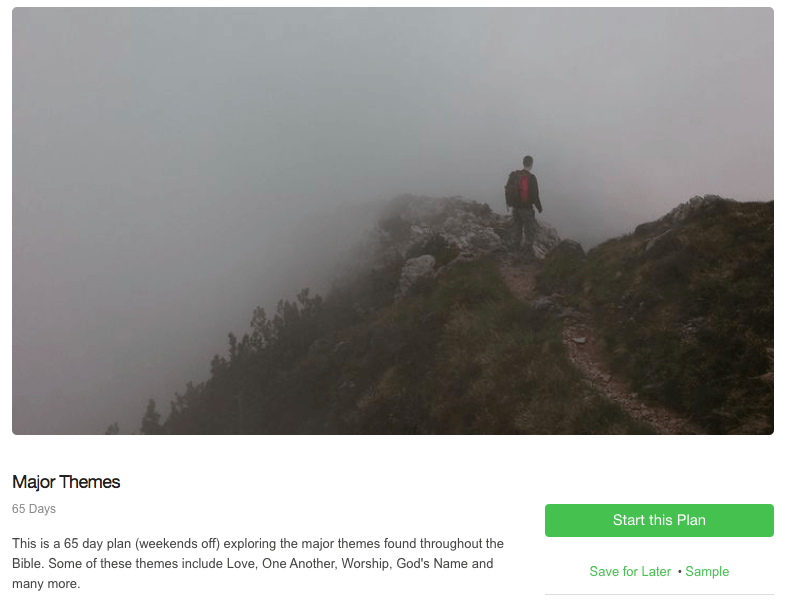 Called simply Major Themes, it’s a 65-day plan that explores major themes throughout the Bible. The devotion each day is a one-word theme accompanied by a chapter from the Bible that addresses that theme specifically. Some examples of themes covered in the plan are love, worship, care for needy, etc. I’ve found a lot of the plans in the Bible app feature very long devotional readings, but little Scripture, so I like that this one focuses entirely on God’s word. The theme provides me with a framework through which to read the passage, and the simple but unique approach has allowed me to have some awesome personal insights. My birthday is NOT my favorite day of the year; in fact, it’s one of my least favorites. But try as I might, I have yet to will it away—March 2nd persists in making an appearance every darn year! But as far as birthdays go, this one was pretty good. I received lots of wonderful texts, calls, messages, and cards and packages in the mail, reminding me of how blessed I am to be surrounded by so much love. Luke and Charleston treated me to lunch at my favorite restaurant (a real treat, since we almost never eat out these days), followed by birthday fro-yo topped with 34 candles. Luke got me flowers and a beautiful necklace from Kendra Scott, and Charleston let me pick the movie for that night’s Family Movie Night. 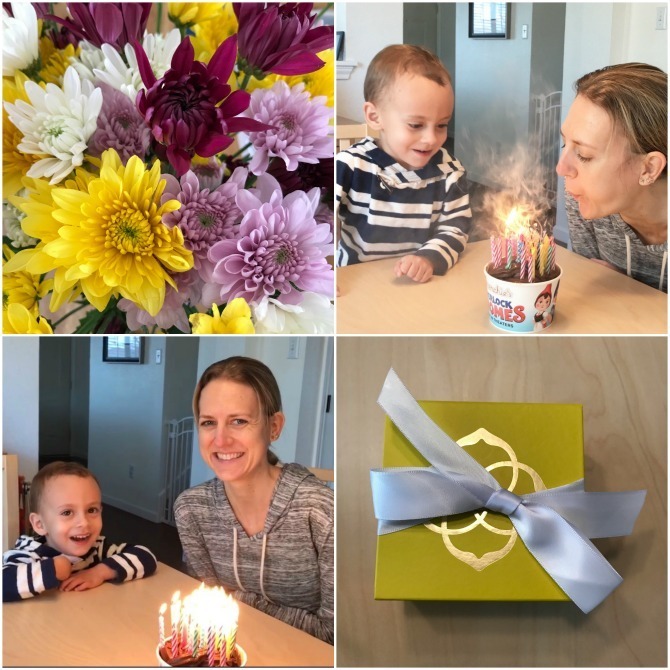 I love my two boys so much, and it was wonderful to spend my special day with them. From a high to a low. . . this month saw our very first trip to the Emergency Room with Charleston. He’d had a mild cough for a couple of days, but I’d attributed that to allergies. Then he woke up in the middle of the night with a barking cough, unable to catch his breath or swallow. He started to panic, and I did too, so although I’m usually more of a “wait it out” parent, we loaded him into the car and drove to the nearest ER. 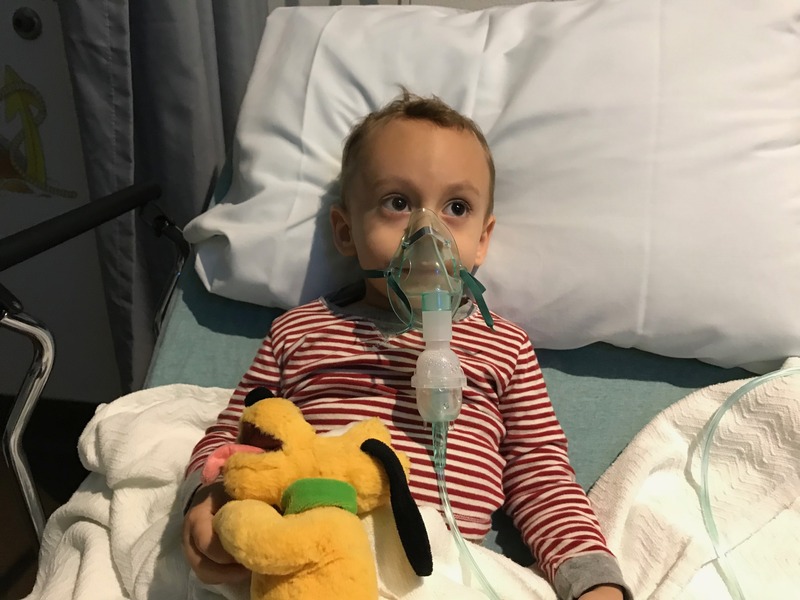 The doctor on call diagnosed croup and gave him a breathing treatment and steroids, which helped a lot. Though I’m still not sure our ER visit was entirely necessary, it was very positive experience. The staff was friendly and helpful, and Charleston was a trooper. Before releasing us that night, the nurse gave Charleston a stuffed ducky (which he insists on calling a penguin); it’s now his favorite stuffed animal and he carries it everywhere, frequently asking when he gets to go back to that “cool place with the Netflix and the bed and the warm blanket.” I certainly hope we won’t be going back any time soon, but I’m glad that his first ER memory isn’t a traumatic one. 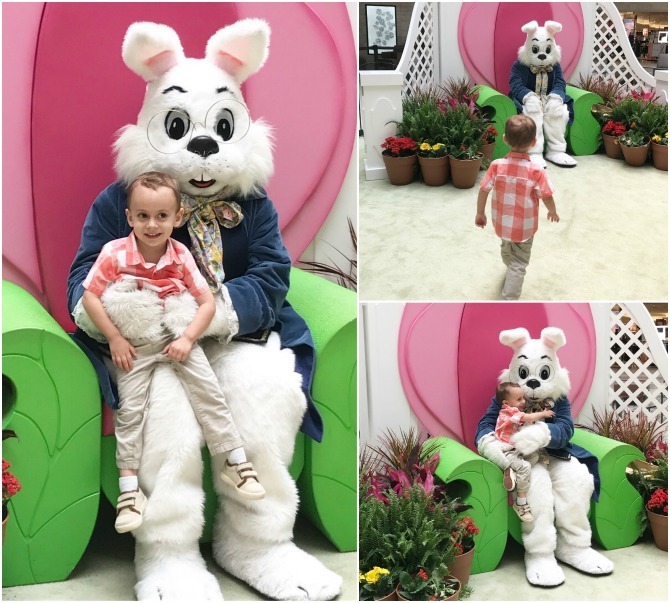 We took Charleston for his fourth annual visit to see the Easter Bunny. I can hardly wrap my head around the fact that we are onto fourths of things in Charleston’s young life. This year’s visit was his best yet. He walked right up to the Bunny, hopped onto his lap, and proceeded to smother him with hugs and kisses. 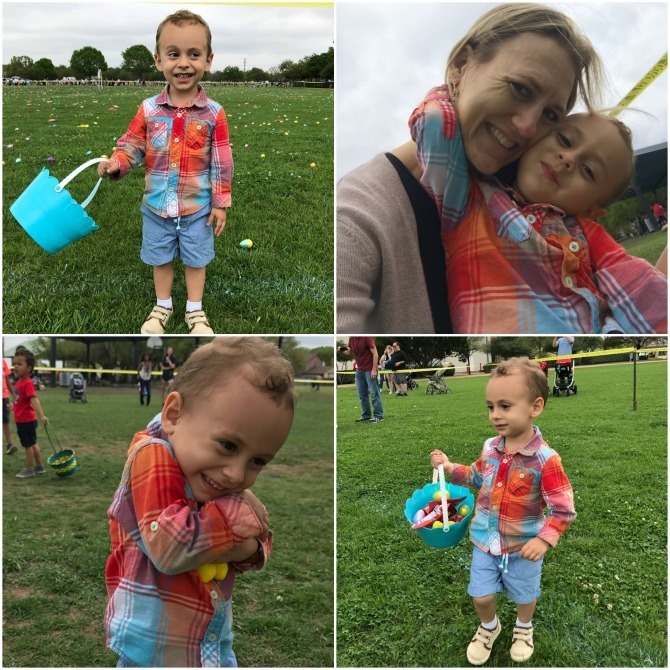 We actually had a hard time getting a face-forward picture because he wouldn’t stop turning to the Easter Bunny to say, “I love you Easter Bunny!” Prior to the visit, we’d had an extremely rough morning at home, but it was hard to stay angry with him in the face of such sweetness. We took Charleston to our town’s annual Egg Hunt. 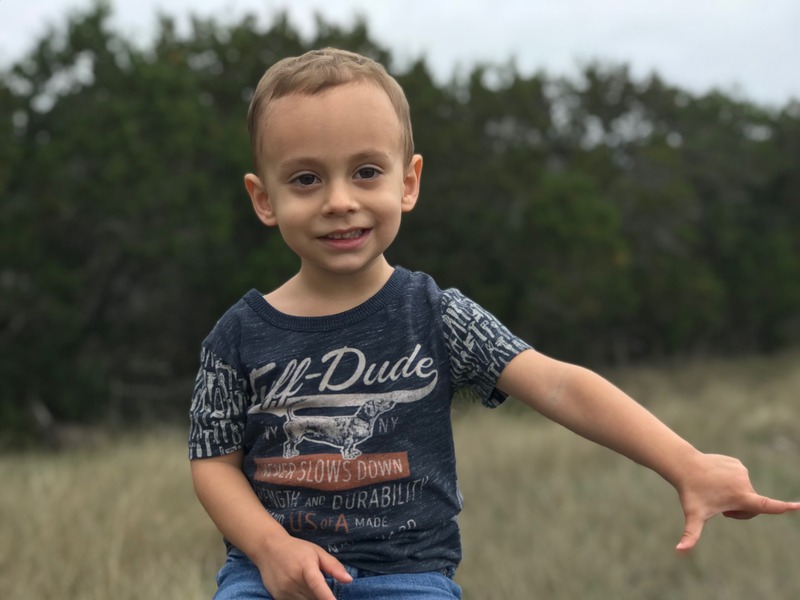 This is the third year we have taken him; two years ago we had just moved to Austin, and the hunt was one of the first town events we attended. Charleston wasn’t even walking on his own yet then! This year he could navigate the hunt like a pro! He was so excited to search for eggs but waited patiently at the starting line; then, when the kids were given the go-ahead, he froze! Finally we got him out there on the lawn and he filled his basket with plastic eggs and other goodies until he announced, “I think I have enough now,” and found a spot to sort through his loot. The eggs were all stuffed with gift certificates for cookies, fries, or smoothies from McDonald’s. A lot of the kids and parents were complaining that they didn’t hold candy, but we were pretty excited! 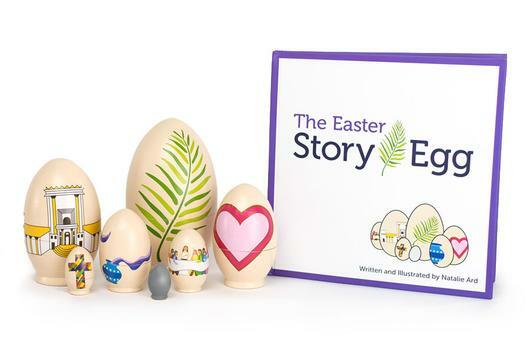 This week we’ve been preparing our hearts for Easter with the Story Egg. We purchased this Advent-like activity last year, so this is our second Easter with the tradition. Each day during Easter week, we open up our wooden nesting egg to discover another egg inside. Each egg is imprinted with an Easter-related image that correlates with a reading from the accompanying picture book. Its a super simple activity, but I love that it’s helping us teach Charleston what Easter is really about. The biggest highlight of our month—and probably our year!—is that we got a dog! Luke and I have been talking about getting a dog since before we got married; we’ll be celebrating our tenth wedding anniversary this year, so clearly we didn’t rush into the dog thing. After years of prompting from me, Luke finally agreed on my breed of choice, a Labradoodle. We found a backyard breeder through a friend, and a few weeks ago we went to pick out our pup from a litter of six. 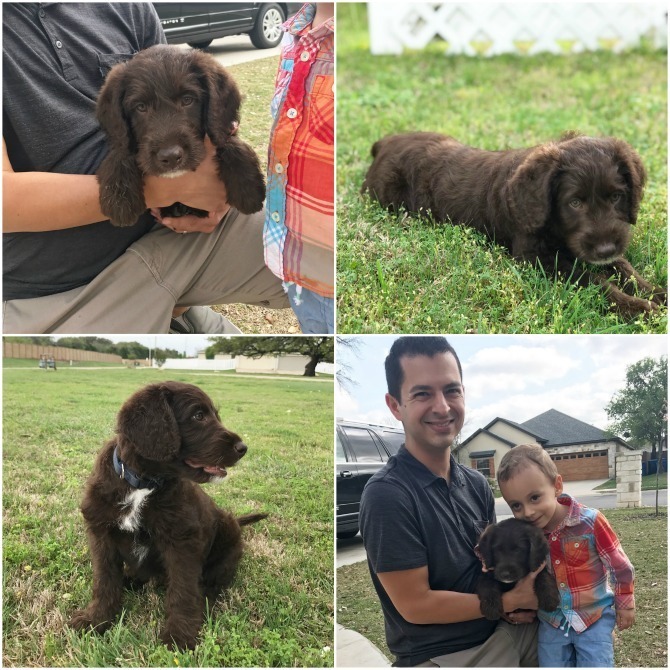 This past Sunday he was finally eight weeks old, and we were able to bring Arlo the Labradoodle home! If you’ve ever had a puppy, you will understand the kind of week we’ve had here in the Jernejcic household. People told me that a puppy was as challenging as a newborn, and while I wouldn’t take the comparison that far, it definitely hasn’t been easy. Crate training has been kicking our butts, and Arlo’s, literally—the first night he was in and out of the crate with endless diarrhea. I lost track of how many times we had to get Arlo out of his crate, bathe him (with Charleston watching on, crying because he was tired and confused), change out the bedding, then wrangle Arlo back into his crate. . . just for it to happen again. Not a great introduction to puppy parenting. Thankfully the vet confirmed it was just a little bug and nothing more serious, and each night has gotten a little easier. 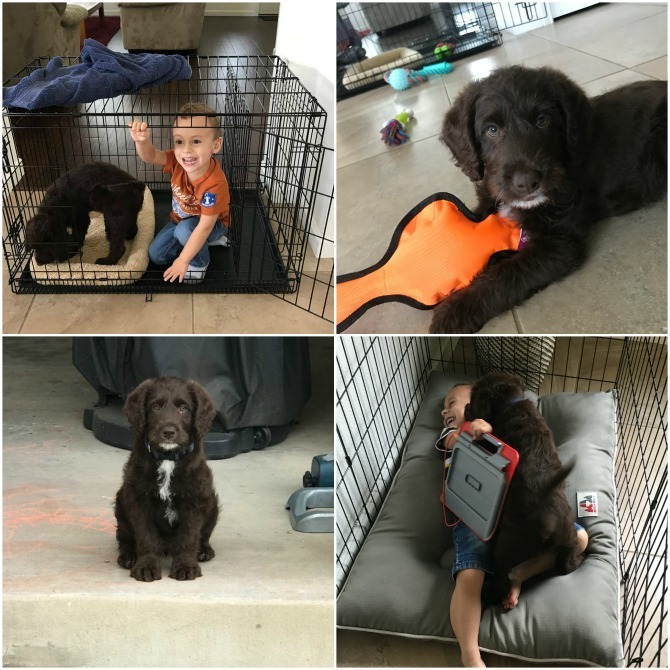 It’s been difficult to know how to navigate a puppy’s needs while taking care of my three-year-old who has never known a life that hasn’t centered around him. However, the good has far outweighed the bad. Arlo is a sweet, fun-loving pup who has completely captured our hearts. We are thrilled to have him as part of our family, and seeing Charleston act as “big brother” to Arlo (introducing him to his toys, reading him books, and frolicking with him on the floor) has my heart exploding with love. And that’s a wrap for March! 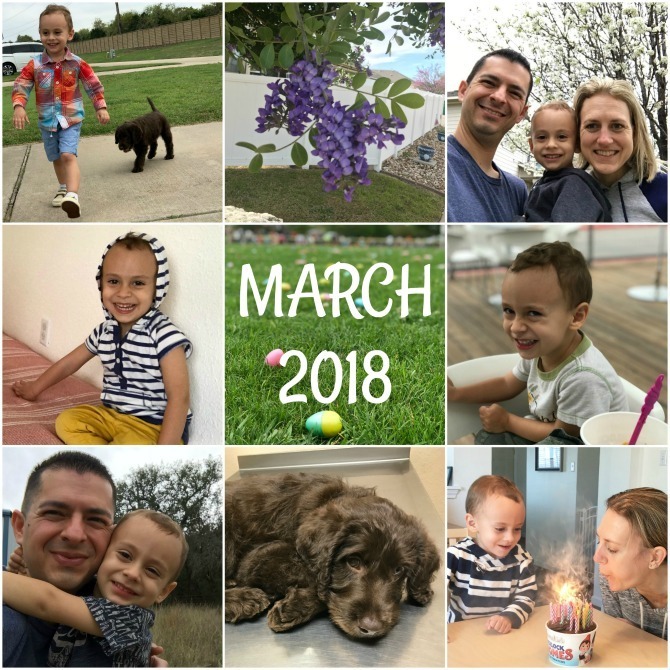 I’m linking up with Leigh Kramer to share what we are into this month. What were some of your happenings, highlights (or even lowlights) this March?